One of my favorite Behavioral Economists Dan Ariely was asked this question, “What’s the best way to improve the quality of marriages? And this was his answer: The No. 1 enemy of relationships is being taken for granted. So I would set up marriages to expire automatically every five years and be renewable only if both parties opt in for another five-year period. Sure, this setup would mean that more people separate (you asked about the quality of marriages, not their longevity). But spouses would have to think more carefully about their partners, take them less for granted and thereby strengthen their relationships. As in any Ariely reply, it elicits laughter then you’d say, “That’s a good point.” Since I am a believer of#MayForever and fresh from my parents’ Diamond Wedding Anniversary last weekend, I will not discuss the merits of the automatic expiration but the renewal part. but you now assess how the years have been being married to each other. You look back into the good times and the bad times. You are somehow led to reflect on the wonderful traits of your spouse, the reasons why you said yes in the first place. You look at your challenges as the opportunities you had to strengthen your character. You reflect on what makes you tick as partners so that you both continue to grow in this marriage. 2. We need celebrations to live a happier life. I am all for marking milestones in meaningful celebrations like wedding anniversaries. Throwing a party (Reminder: Only what you can afford) is our concrete way of thanksgiving and getting approval for what we have accomplished. I think I inherited my mom’s fondness for renewing wedding vows. They renewed on their Silver (25th), Ruby (40th), Golden (50th) and last weekend their Diamond (60)! Given how fragile marriage has become these days, I started even earlier as our first ceremonial renewal was our Tin Anniversary when we turned 10. Family occasions that give us the opportunity to meet extended relatives are weddings, wake & burials. I don’t know about you, but I’d prefer the happy one. Thank you to all our family and friends who took the time off from their busy schedules and flew in to Laoag, Ilocos Norte to celebrate this very important milestone with us. 3. Our children are now a big part of the ritual. Our children are important reasons why we need to have a loving and stable marriage. Yes, you can argue that the couple’s love and happiness take precedence over the decision whether to go on with the marriage, but having seen how children suffer from broken marriages, I think we have to rethink this reasoning. We brought them to this world and it is our duty to give them a loving, nurturing and stable home while they are growing up. If you are lucky to be blessed with children, wouldn’t it be great to have them in your next weddings? I remember how a niece complained when she first looked at her parents’ wedding album, “Why wasn’t I invited to your wedding?” So unless you’re one of those who had your children before you decided to tie the knot, this is your chance to invite your children and make them part of your wedding! 4. It gives you a chance to do something that you weren’t able to do the first time around! My mom opted to have a very simple wedding 60 years ago. They held their wedding at an ungodly hour of 4:30 in the morning, and she didn’t even march that long aisle of the St. William’s Cathedral in Laoag City. Even if they have renewed their vows a number of times, last week was their first time to renew it where it first happened. After 60 years, and even with some difficulty walking long distances at the age of 85, she finally walked that long aisle as her groom not just waited for her at the altar but also sang Gaano Kita Kamahal! To those who regretted not having had this or that, especially because you were so young and your mother (or mother-in-law) took over your wedding, including the expenses, now is your chance to do it your way! 6. Your vows would be more meaningful this time. When you said I Do the first time around, chances are, you had not seen the “warts and all” of your spouse yet. You had not experienced going through the painful labor of childbirth, rushing your sick children (and each other) to the hospital, seeing your savings dwindle as you build your dream house, overcoming career challenges, in-law conflicts, or even just the minor irritations of each other’s mannerisms which you used to find cute during your courtship days. Now that you have such a wealth of experiences as husband and wife, now that you have overcome all those challenges and come out a stronger union, you can say those vows with profundity that you couldn’t have imagined when you exchanged your vows the first time around. If you work on your marriage, I promise, it gets better every milestone! 7. To those who are encountering challenges, a renewal of vows may help you reset that button. However, may I suggest that you do this just quietly, maybe between the two of you, or together with your children. Here’s why. Some couples renew their wedding vows with a big bash thinking that it’s the solution to their problematic marriage, and end up breaking up after all. Then chances are, since you made it public, people (or worse, even you) would attribute the cause of the break up to the renewal bash. But the truth is, you already had problems, and going through a high stress situation of preparing for a wedding may actually exacerbate things. So why don’t you really assess your marriage together then work out a really private renewal, then allow your marriage to rekindle and become even stronger. It should be when you are both alright with the marriage that you can throw that big bash to celebrate with loved ones and share your happiness of going through a challenge together and coming out triumphantly! 8. You inspire your younger family members and other people. 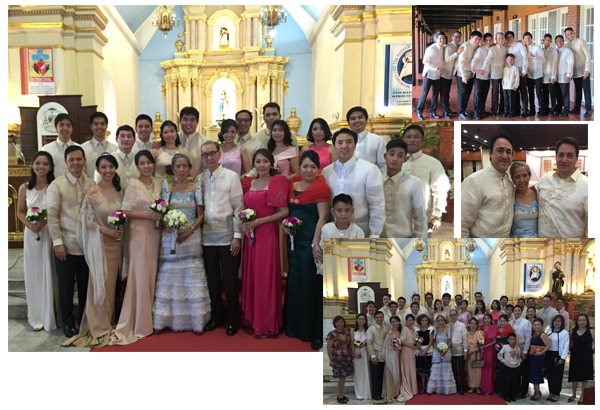 Relatives and friends from all over flew in to Laoag, Ilocos Norte to celebrate this milestone wedding. We are overwhelmed with the love and praise showered on our parents on how they have inspired everyone. Our own children are inspired by the love and life lessons they learned from their grandparents – lessons on the challenges of two different people living together, that no matter how much you cry out love, if there’s no respect, a marriage will not work. I saw my son’s post that says, “Thanks Lolo and Lola for teaching me that love is spelled as R-E-S-P-E-C-T!” Hopefully, they will remember these lessons when their time to apply them comes. Seeing two octogenarians look at each other the way they did inspired everyone that indeed #MayForever! They did it again! The author’s parents Rufino & Josefa a.k.a. 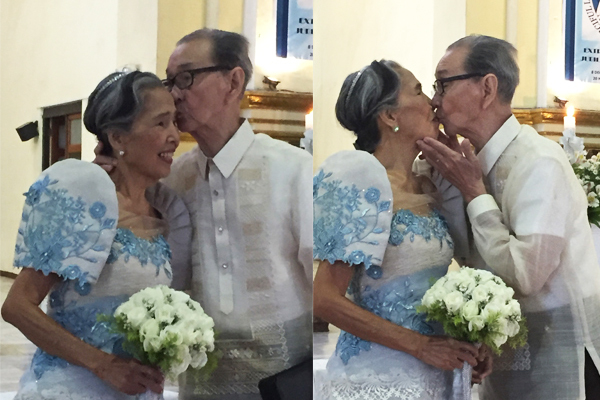 Pinong & Pepay Fres sealed it with a kiss once more after 60 years of being married. So to answer the title of this article whether to renew or not to renew, I’d say to married couples RENEW because even if marriage in our country has no expiry we need that other aspect of renewal – i.e. to become NEW and FRESH! Again, to my dear parents, thank you for giving us a stable home while we were growing up. Thank you for being the living examples of how it is to always keep it FRESH in the Fres Family! ATTRIBUTIONS: Images used are from the author and Bobby Sayo; Videos from Enrique Fausto and Rose Fres Fausto.